Adding more fruits and vegetables into your diet, and the diet of your children, is one of the most common things I hear of. There is only so much room in our bellies and on our plates to get the daily nutrients we need to maintain a healthy body. Trying to help our kids bodies grow and develop in a healthy manner requires the amazing mineral, vitamins and nutrients found in real, from the earth produce. I can buy fruit juice with some veggies in it. Some pasta sauce that has a tiny bit of vegetables blended in. But how much are they really getting in their bodies? So few Americans consume sufficient portions of produce, Juice Plus might be one of few appropriate alternatives for people who lack adequate fruits and vegetables in their diets. According to the CDC, only half of the total U.S. population consumed more than a cup of vegetables and one and a half cups of fruit daily, whereas the USDA suggests consuming double those amounts. The World Health Organization estimates that 6.7 million people worldwide have died due to lack daily consumption of fruits and vegetables. Juice Plus isn’t intended to be a substitute for real meals. You would be very hungry if you ate the capsules instead of real food. Juice Plus simply bridges the gap between what we DO eat and what we SHOULD eat. It’s also for people who dislike the taste of fruits and vegetables and need to get their recommended dosage of nutrients. According to multiple studies and consumer reviews, people who take Juice Plus supplements get sick less and experience other physical benefits like improved skin or lowered cholesterol. Juice Plus not just a vitamin. This is because Juice Plus+ provides whole food based nutrition. There are 20 fruits and vegetables in their convenient and tasty gummies (adults consume 4 gummies daily; children consume 2 gummies daily). Juice Plus+ uses real, actual fruits and vegetables and in their products. They begin with the highest quality, farm fresh produce grown by some of the best farmers in the world. Once a fruit or vegetable is picked, it begins to decrease in nutritional value. They solved the issue of reducing that valuable decrease time by locating juicing and drying facilities as close to their partner farms as possible. When there is not a facility close enough they use a process called Individual Quick Freezing, to ensure the freshness of every single vegetable and fruit used in their products. They constantly test their soil where the produce is grown to make sure it is in perfect condition of optimal health. 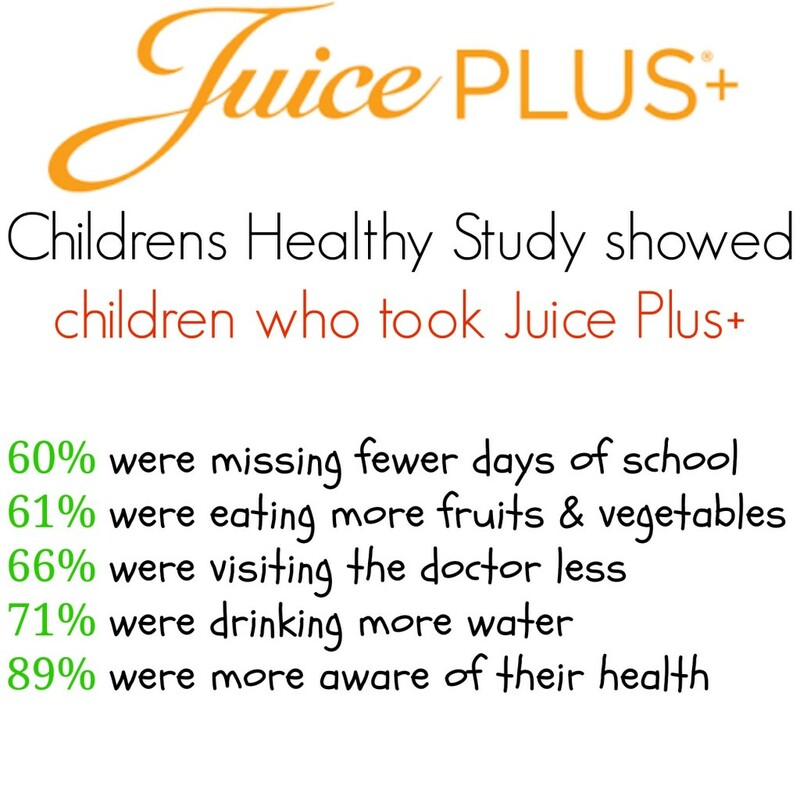 The Study provides Juice Plus+® Orchard Blend and Juice Plus+® Garden Blend FREE to your child between the ages of 4-18 or full-time undergraduate college student for up to four years, so long as you continue to take Juice Plus+®, too. Juice Plus+ is the approved by the NSF and is the most thoroughly researched brand-name nutritional product on the market today. There have been over 30 published clinic studies done to confirm the amazing benefits of Juice Plus+. Even the famous Dr Sears recommends children to take Juice Plus+. I was blown away by how many medical professionals are standing behind Juice Plus+, internal medicine, sports medicine, cardiology, biochemists, glaucoma specialists, pediatrics, dentistry, infectious diseases…the list goes on! To hear some of these medical professionals talk about Juice Plus+ click here.